Home / News / Distribution: Are Drones the Future? Distribution is a big business and as an order fulfilment house covering the UK and Europe we have followed with interest the research into drones for distribution. While to many of us Unmanned Aerial Systems (UAVs) or distribution drones still feel far-fetched and like something out of a science fiction film, with big names such as Amazon and Google engaged in research and development, drones could well be the future of distribution. In fact, Google recently unveiled its drone-delivery distribution service called “Project Wing”, and according to Amazon founder and CEO Jeff Bezos, “Prime Air” could be available to customers as soon as the Federal Aviation Administration (FAA) grants permission. However, there are currently major downsides to the proposed Amazon drones that will need to be addressed before they “take off”. For instance, they are useless in adverse weather conditions, they are limited to a 10-mile radius, and their battery life would be so short as to make this 10-mile trip a challenge. Although they’ll initially only be able to carry items up to five pounds, this is roughly 86% of all deliveries Amazon makes. Despite the limitations, new research commissioned by the National Aeronautical Centre (NAC) reveals that 42% of distribution companies in the USA believe their business plans to use drones for the distribution of cargo in future. It’s thought that drones may provide cost savings for such companies in the long term, as it is anticipated that fuel requirements for drones will be lower than for conventional aircraft, which are currently used to transport huge volumes of cargo. While the companies surveyed were keen to use the drones in future, on average, they believed they wouldn’t witness the introduction of these solutions for commercial application within the next 15 years. A major concern was the insufficient weight the drones would be able to transport. Another limiting factor is that the law on the commercial use of drones in the UK (as well as the USA) is confused, complex and full of regulations and licensing requirements, thwarting many companies’ drone ambitions. 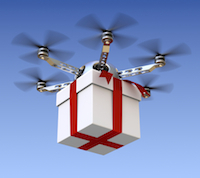 There is no doubt demand in the marketplace for drones capable of distributing goods. The challenge for those involved in the design, manufacture and testing of drones is to ensure the delivery of commercially viable applications. It is almost inevitable that the law will evolve in parallel, becoming more sophisticated as the industry does. Despite the stumbling blocks employing drones for commercial use, it is no doubt a big, booming business that will soon be a reality. This entry was posted onFriday, September 19th, 2014 at 12:24 pm and is filed under News. You can follow any responses to this entry through the RSS 2.0 feed. You can leave a response, or trackback from your own site. Both comments and pings are currently closed.